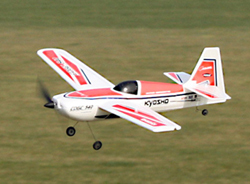 Kyosho's Complete Electric (Semi) Aerobat! Enter the Kyosho Minium Edge 540. But the Edge 540 is the one I plumped for. 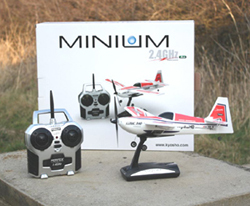 Now this little model comes with it’s own 2.4gHz transmitter and charger plus one Li-Po flight battery. You will need 8 AA Batteries to fly and charge the flight Li-Po. The charger is built into the plane stand. You just remove the battery from the under side of the plane and slide into the charger. It takes about 25-30 minutes to charge a battery. Although the instructions say 20 minutes I have found they need slightly longer. A switch on the transmitter chooses Mode 1 or 2. The throttle starts at mid stick no mater which mode you select easy and a simple solution to making sure mode 1 and 2 are covered. Now yes it's aimed at indoor flyers but it does fly outdoors? Well, the answer is yes. Mine has always flown outside but I have discovered that 9 mph is about the maximum you'll want to try and fly it in. I used our pilots box slabs to take off from. It takes around three feet to get into the air. When it's up a little trimming will be required on the first flight, but after that it'll be fine. The transmitter remembers any trim alterations you make. 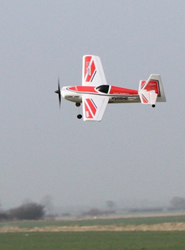 You get about 5-6 minutes flight time from the on board Li-Po battery and it will fly in 9 mph winds! The model is not bad in a straight line but when you turn, its not so nice. You need to power up even for a gentle turn and bring it around using the elevator. It will drop a wing and go in. Also, use too much aileron and it will also drop a wing and go in. It takes some getting used to but it won’t behave like a larger model so don’t expect it to. However, it does fly nicely once you get the hang of it. Good figure of eights and circuits are more than possible even in a light wind. When the battery gets low you loose power and the Edge has the glide angle of a brick! You can get a spurt of power after the first time the power cuts but basically use that spare bit of power to land. What can it do? Well being three channels there’s no rudder which is a real shame. I think that if it had a rudder it would be even more fun. It will roll but it will also dive down heavy unless you push the elevator down hard when inverted. The Edge 540 doesn't like to remain inverted at all. Loops are possible but get plenty of speed up, and pull back, it will go over. A fellow Club member who has one believes it may do Cuban 8's… no reason why not in the hands of a good flyer. A Split 'S' is possible and I cannot wait to try the up-rated motor in it. It should have more punch and be even nuttier. I did go quite high up and it will spin in. But just remember to pull out before it gets to low. Inverted flight is a 'no go' area really, the wing's dihedral really doesn't help it. There are a comprehensive list of spares available and I'm tempted to get a spare main wing and break it in half, and take some of the dihedral out.. But with no rudder I might be asking for more trouble than its worth. So with most aerobatic moves that don’t require the rudder it stands a good chance of being able to do them. Not cheap for what it is really. The price was around £72.99 when I bought, but now they're up to around £99 in places due to the current Pound/Dollar/Yen thing that’s currently going on. I think £72.99 was a fair price but £99 may be getting a bit high for what they are really. Two versions of the Edge are available, one in a blue colour scheme and the other in red. And if you already own your a 2.4Ghz radio, a cheaper option to the Ready Set (complete radio & aircraft) might be the Plane Set. An Plane Set refers to an airplane-only set without transmitter, making it an ideal 2nd or 3rd addition to you aircraft collection. Use your existing MINIUM series transmitter with other models from the lineup. Spares are readily available and the spare batteries are cheap enough at £6.99 each as well. But if you don’t want a shock flyer and Li-Po charger etc etc it’s a good little model and takes some abuse ideal for indoor flying and light windy days outside. More details can be found on the Kyosho website by clicking HERE. 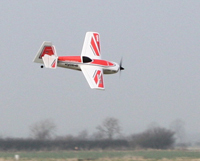 Forum member Dave (AKA Bravedan) has also built and flown the Kyosho Minium Edge 540. Here he reports on his experiences and how the model flies indoors. I'd considered buying a Minium for some while, at the time when the Cessna and the Citabria were all they had in the range, but like Disc had considered the price was a bit steep, especially for Rudder/Elevator/Throttle control. An upcoming birthday and the announcement of the Edge 540 with Ailerons (even if no rudder) changed my mind and on my list it went. Now in my hands and flown, here's my opinion. If you don't know my background, a couple of words will set these comments in perspective. I fly RC Heli's and Planes (mostly fast nervous flying wings, powered and slope soaring, and I also have a 91 powered Panic Biplane), I also race cars. I do a lot of Indoor events and can use a hall almost any day I want. The downside is it is a very small hall, and has quite active warm air heating, so it's not a "no wind" situation! Firstly, it's good to see a manufacturer taking a little trouble to ensure that the packing is useful AFTER that first opening. The Plane, Transmitter and Charger Stand come wedged with reusable nicely fitting moulded foam blocks which should see it able to be used for safe storage and transport for it's life............well done, Kyosho!! My plane was nicely made and the stickers were all affixed well and in line, again, it seems, you are getting what you pay for. Good Stuff! The battery connection is a bit fiddly, but then most small electric planes are. While the battery mounting to the plane looks OK, I have seen several on Cessna's etc fall off in flight and dangle on the wiring, may be the operator of course, but a point to bear in mind, always check the velcro IS holding it well. While the Charger is stylish and works OK, it's worth pointing out that you can buy third party "aftermarket" leads to charge from any suitable LiPo charger, and even leads to be able to chain connect batteries so each one is effectively acting as a cell in a multi cell battery so you could safely charge two or three at once from one multi cell LiPo balancing connector charger. (Do NOT make your own as any error could create a fire hazard). Mine needed only two clicks of "up" to trim for level flight. Be warned, despite the dihedral on the wing, the Ailerons give NO steering effect on initial ground movement, so face it correctly into space before trying a take off and give it roll out space straight in front on landing . Now, I'm well used to what are called "Bank n Yank" planes such as this, ones with Aileron and Elevator only as flying surfaces, and with tight space indoor flying, so I wasn't expecting any flying issues at all, and didn't experience any. I can however see exactly what Disc is getting at..................the plane WILL bite if not flown to it's strengths. However, it can with little effort be flown extremely smoothly and after a couple of circuits I was easily able to fly circuits both ways at less than a metre up at even height, balancing elevator with throttle. It also responds very well to Pylon turns, where you climb into the turn proper and wingover down into the next straight, useful to tighten the turn radius. 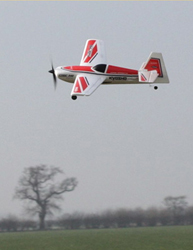 It initially seems quite fast flying, but can be slowed reasonably well with a little experience, however in my opinion it's NOT suitable for a novice OR as a first Indoor plane. It is very satisfying to fly it well though, and the overall "flight experience" is a happy and satisfying one. Disc is spot on with regard the glide, there simply isn't one...you need to land with a small amount of power on, whereupon it becomes a super little toy to practice ultra smooth touch and goes with. Flight time on the tiny battery is very good, and the batteries are a fairly cheap buy. Get Loads!! I am very definitely going to experiment on mine once the newness has worn off. I already fly no dihedral no rudder Bank n Yank planes indoors, and see no reason why the dihedral could not be removed on the 540, but that does not mean it is no good as it is, and if you have some aileron experience, you should find no particular issues with this plane as supplied, given that you are not going to be doing inverted harriers with it!!! Marks out of ten? A very satisfying 8, and I'm a hard man to please. A good little model that takes some abuse. Ideal for indoor flying and light windy days outside.